Everybody urged me to read Option B. After reading Sheryl Sandberg's Facebook post and hearing her interviewed 4(5?) times (what a marketing campaign for this book!) I was pretty sure I didn’t want to. Nevertheless, I put myself on the wait list at the library and, months later, the book was mine. (Sheryl, the COO of Facebook, writes Option B after the sudden death of her husband Dave on May 1, 2015). Fortunately, it is a short read. I read it the day before, the excruciating day of, and the day after, the 18-month anniversary of Beryl's death. Chapters 2 and 10 had some words of interest. I love in Chapter 2 how she talks about “Non-Question-Asking Friends.” Yes, with capital letters! I fear I know some of these, family as well as friends. And, of course, there's the other side of the coin, the friends who engage and are gifts and surprises in my life. I had to draw away from some, and draw towards others. Chapter 10, the last chapter, is about love and laughter, and I found some words of wisdom here. Actually, any time Sheryl wrote from her heart about her relationship with her husband Dave, their children, and her grief, the writing spoke to me and resonated with me. The real problem is the role of the second author, Adam Grant. It is way too big. Grant teaches in U-Penn's Positive Psychology program. I have studied Positive Psychology, and I know many of it's studies, attributes, attitudes, and actions. I became real sick of Sandberg and Grant telling me about Positive Psychology interventions: how to improve my self-compassion and self-confidence; how I should keep a journal of contributions I make every day, not gratitude; how to take back joy; how to be more positive, etc. 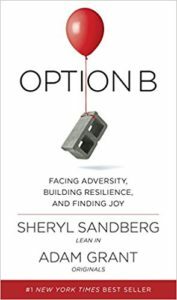 Most of Option B read like a self-help book for ending grief and I resented it. There was also a lot of filler about people and situations such as after-action reviews at Quantico, Rwanda, and Charleston. Huh? I can't seem to recommend this book to anyone, neither those who are grieving nor those who offer support. Oh boy, tonight I can begin a new book! I am relieved! You are right about the marketing of this book. Seems like she’s been on every talk show and in every magazine. I gained one thing from your review – the suggestion to ask “how are you today?” Hadn’t realized the value of specificity. Will try to incorporate into more conversations. Thank you. Good! A small change for all of us…!